` Ang Geck Geck: Who is my date? A guy in red speedo. Who is my date? A guy in red speedo. 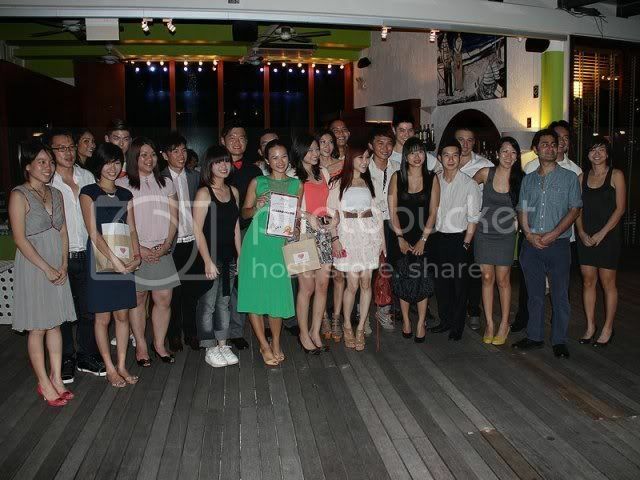 On 16th of Feb, I was auctioned at sold.sg for a charity event at Limoncello Italian Pizza & Grill Restuarant at Robertson Quay with the rest of the other 9 bloggers. Over a period of merely five days, this charity auction raised S$2038.50 from the public’s bids, and in addition to the money raised from the auction, SOLD.sg also contributed $1 to match every $2 raised.A total of $3,100 was raised and were donated to the Spastic Children’s Association of Singapore (SCAS) over a group dinner date at Limoncello Restaurant. Ok keeping it short and sweet. The guy who dated me on V day is none other than.. Jing Quek! Yes he is the guy in red speedo! The first time I've seen him was on a Youtube or Vimeo video 3 years back. This was the video. The video was so crazy that my eyes nearly popped out. We are not total stranger to begin with. The first time we met is when I was one of his talents for his Singtel shoot but I didn't know he was the guy in red speedo because he looks pretty normal in real person until someone told me that guy is JING QUEK... I never know we will cross path, imagine you see that person in youtube and the next thing you met him in real person and we became friend. Today he is someone inspiring and a mentor to me. I am quite honoured to have Jing as my special V day date. Jing's photography work is really impressive and he is such an interesting person to hang out with. Last but not least, thank you to the rest of the bidders who tried to bid for a date with me. I really appreciate it. You made my day.